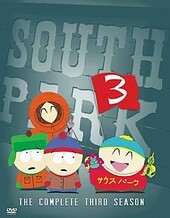 Trey Parker and Matt Stone's commentary always make South Park complete season DVDs a treat. There aren't much special features beyond that, BUT you do get the entire third season of South Park, and you can't lose there. "The Succubus", "Sexual Harassment Panda", "Two Guys Naked in a Hot Tub", "Jewbilee", and "World Wide Recorder Concert (The Brown Noise)" are just some of the seventeen episodes you get on these three DVDs. What is there to say about South Park that hasn't been said before? Not much. This show is a classic and even today, on its eighth season, it hasn't lost any momentum. Fans of the show, collectors, anyone who likes brilliant comedy in a playful manner, this is for you.